From 13 until 15 April, around 40 people met in The Netherlands for a conference about recognition of non formal learning in voluntary work. They not only represented Scouting and Guiding, but also local volunteer centres, national organizations for the support of volunteers, and formal education. The event was organized by Scouting Gelderland, one of the regional centres for training and support of scout leaders in The Netherlands, together with partners from Sweden, Scotland, Germany, and Slovakia. 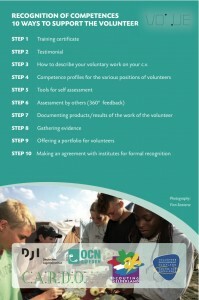 to present guidance for tools and processes that organisations can use in the recognition process (resources/trainings/criteria for tools/different levels of tools). to present and exchange good practices in the field of recognition of non formal learning. New developments on European level, such as the European Qualifications Framework and the European Skills Passport, were presented, and the participants explored and discussed opportunities for future cooperation.